OIO presents “Something Simple” for the holidays: Benjamin Britten’s Simple Symphony, the Beatles’ Something, Simple Gifts, plus music from Bach’s Brandenburg Concerto IV and Corelli’s Christmas Concerto. Benjamin Britten wrote four movements, all with alliterating titles for string orchestra: Boisterous Bourrée, Playful Pizzicato (plucking the strings), Sentimental Saraband, and Frolicsome Finale. Something and Simple Gifts are arrangements for string orchestra by Cathy Young and Renata Bratt, respectively. Featured soloists in the first movement of the Bach Brandenburg IV are flutists Susanella Noble, Cheryl Shine, and violinist/OIO Artistic Director Cathy Young. Cathy, Susanella and Cheryl have played together in the Kamuela Philharmonic Orchestra for over a decade. This will be Susanella’s and Cheryl’s first performances with OIO. Susanella is a graduate of the University of Denver. She studied flute with master teachers/flutists in France, has toured the country, but is happy to perform, teach, and arrange music right here in Hawaii. Cheryl Shine started flute lessons as a public elementary school student in Connecticut. Despite her love of music, as an adult she didn’t play much for many years until she took up lessons again with Susanella Noble. Cathy Young founded OIO in 2006. She teaches privately and in group classes, where students learn violin, viola, cello and piano using Dr. Suzuki’s teaching philosophy. Her two children learned to play violin, and continue to contribute to OIO when available. Cathy’s students are featured throughout the concert. Mark Caudill grew up in the Boston area, learning to play his grandmother’s violin in youth orchestra. He studied fiddling with Jon Singleton in Charlotte, North Carolina, toured for five years with the band Cantiga, and now teaches math and physics at St. Joseph’s School in Hilo. Ina Klasner is a senior at Hilo High School. She studies cello at Young Music Studio, in her sixth year. She recently auditioned and was invited to perform with the Hawaii All-State Orchestra. The orchestra will meet on Oahu for a weekend and perform a concert on January 20, 2019. The OIO concert starts with “pre-orchestra” music by Bach, Carl Maria von Weber, Handel, and Seitz. At the end, you are invited to sing along while OIO accompanies you in some holiday favorites. Walter Greenwood and Cathy Young conduct. 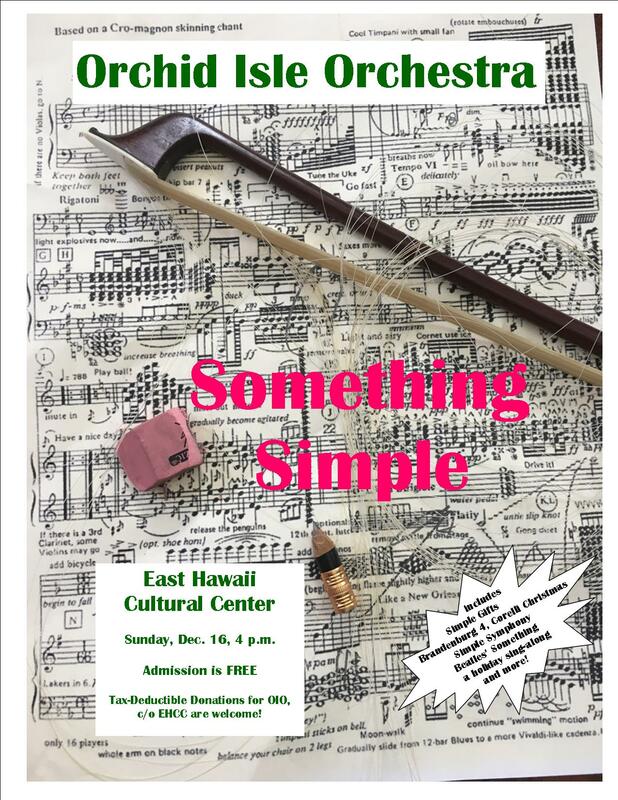 The concert is free; donations will benefit Orchid Isle Orchestra, East Hawaii Cultural Center, and more string music education. For additional information, call Cathy Young at 982-9307. 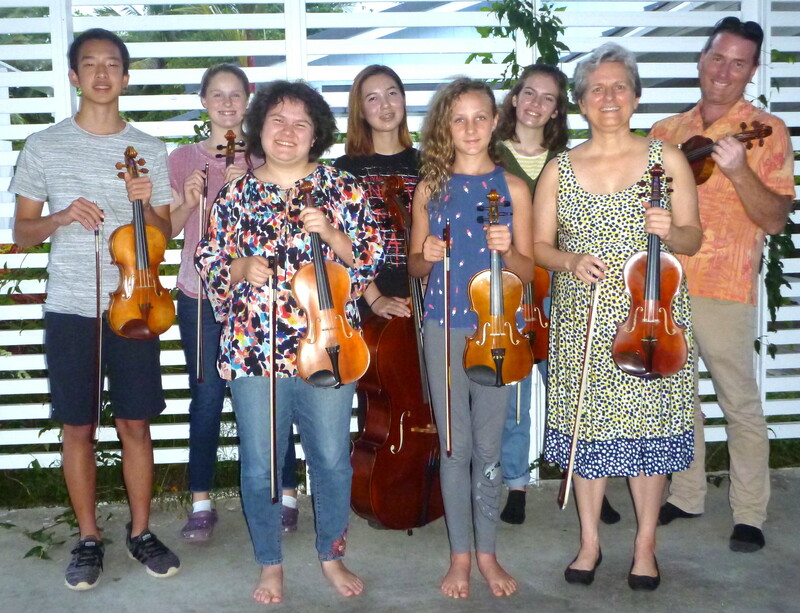 Caption: Pictured, left to right, are eight of the 25 performers for OIO’s December 16 concert at EHCC: Kevin Li, Hope Mikkelsen, Elizabeth Young, Ina Klasner, Lilyana Badgley, Lichen Forster, teachers Cathy Young and Mark Caudill.